There’s something both joyous and tragic about RnB singer and hip-hop associate Frank Ocean’s decision to come out as bisexual. In 2012, this shouldn’t be as ‘heroic’ or ‘brave’ as people are making out. Personally I’m thrilled, as Frank Ocean’s rising chart stature in a music genre that’s still so closeted about its gay and bi community can only help beat a path to the overdue acceptance of people’s sexuality. The internet is awash with commentators congratulating his brave and bold move, however his move is also marred with people commenting that they will ‘still love him the same’ as if he’s just announced he’s had his arms amputated and needs some pity. The magnitude of Frank’s news is significant. Coming out as a gay man in black music is about as difficult as a footballer saying he likes guys in skirts. Journalist Musa Okwonga Tweeted: “Irony: as black men we get raised that being gay or bi is unmanly, but coming out is the first day I felt like a man. 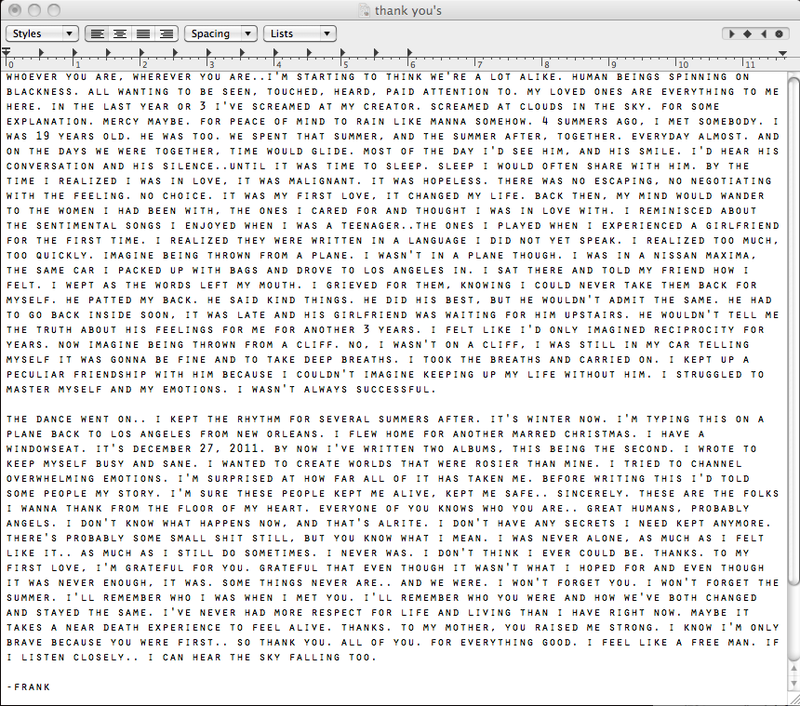 Salute, Frank Ocean. Musa continues – “Heterosexuality is an iron straitjacket in so much of black music. I can’t imagine the guts it took Frank Ocean to do that”. What’s also interesting is Frank’s context. He’s the smooth crooner in the rough-edge band Odd Future who, if you didn’t know, are a gaggle of hooded American skater kids headed up by the gruff-voiced Tyler The Creator. Their lyrics muse around topics of killing, stalking girls, masturbating and general stuff you wouldn’t bring up at the dinner table. Not really surprising for a group who are otherwise known as Odd Future Wolf Pack Gang Kill Them All (OFWPGKTA). More ironically, they were last year dropped from the Big Day Out festival in New Zealand due to their homophobic lyrical content. Despite Frank’s coming out, barely a bat of an eyelid is made at the well-known fact that their DJ and sometimes vocalist Syd tha Kyd is an out and what-of-it? lesbian. This goes to show how gay men in black music find it more of an issue to assert their sexual preferences. The fact that Frank is out makes me happy. The fact that this needs writing about makes me sad. In Frank’s letter he summarises that he wanted to ‘create worlds that were rosier than mine’ and in a world where our celebs are our pied pipers, he may well be putting those wheels in motion. Let’s hope that one day these revelations will just be another drop in the ocean.